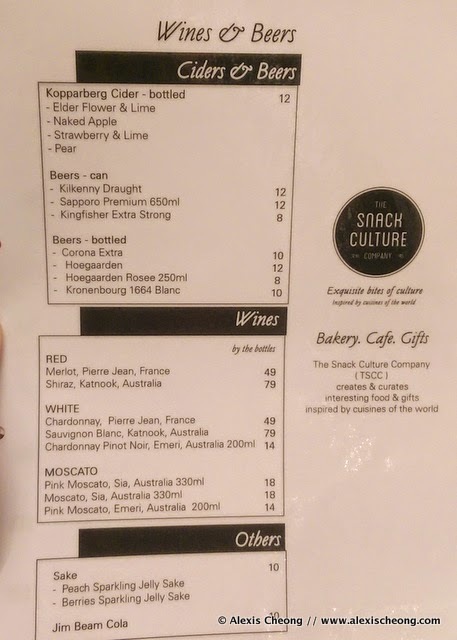 There's a really neat restaurant/bistro at the second floor of CT Hub at Kallang Avenue called The Snack Culture Company that I've been frequenting a lot. This is a lunch spot I'll recommend to anyone who's looking for a healthy yet delicious lunch option around Lavender. This is especially relevant for people working in Pico Creative Centre (my office building) and Aperia (the rather new office/retail space with 24-hour Tim Ho Wan). I really hope they will get more business so they will remain open! 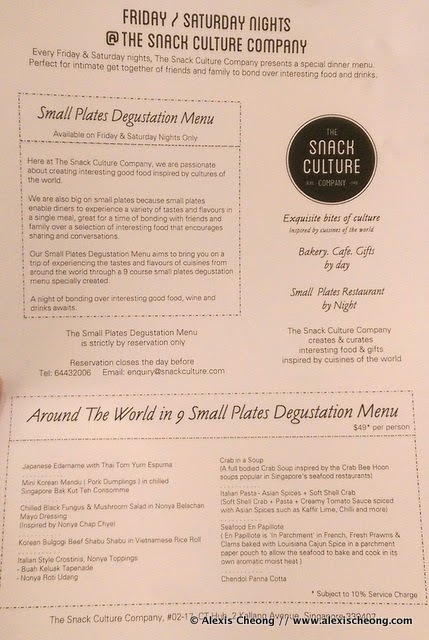 Here's their menu. 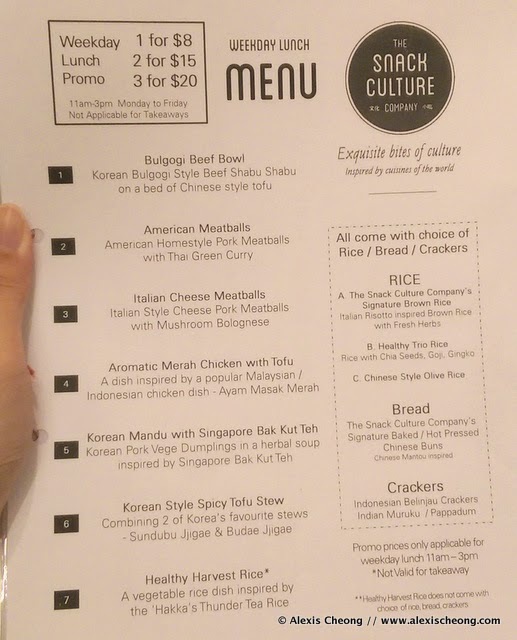 The Snack Culture Company has really interesting meal offerings like Bulgogi Beef Bowl, Meatballs and even Kimchi Chigae. The twist is that they all come with rice/bread/crackers, and their rice is really good because you can choose from brown rice, olive rice or rice with chia seeds and goji and ginko! 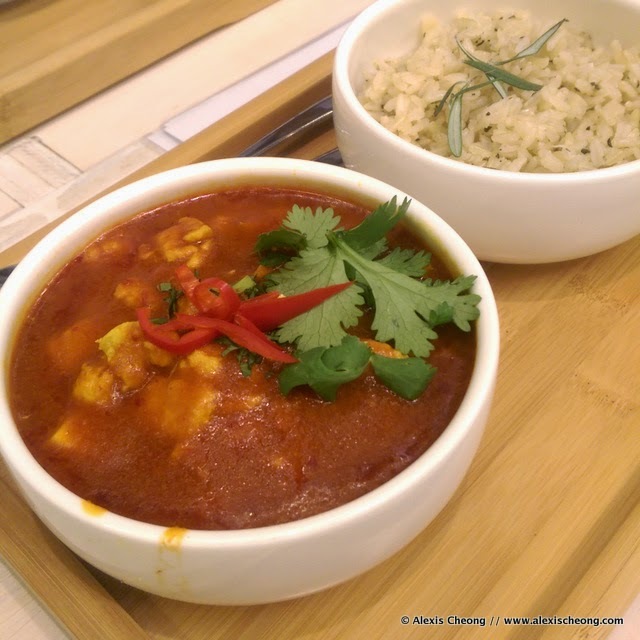 I tried the Aromatic Merah Chicken with Tofu today as it was new on the menu! It was flavorsome and contains plenty of tumeric (good for health) amidst smashed chicken and tofu. I love the gravy too - perfect to soak my brown rice with. I used to order their Korean Spicy Tofu Stew, but it's a little too spicy for me. Plus it's probably the most unhealthy among the lot with the chunks of luncheon meat in there. My colleagues had the bulgogi, also a favorite. The Healthy Harvest Rice (thunder tea inspired) is for those looking for even more of a healthy kick. The best part is, the entire meal only costs $7 each if 3 of you order together (3 for $20). What a good deal! I also found out today from Dr. Leslie Tay's Facebook Page that the owner of the restaurant is a doctor. He came by today after lunch to have a chat with us, and I found out that he still maintains his medical practitioner license! However, his penchant for inventing innovative dishes saw him doing "strange things" after a few years of practice, of which Snack Culture is one of the results. Check out their Fri/Sat night degustation menu that's by reservation only. The tapas dishes are all really interesting, such as Edamame with Tom Yam foam. There's also alcohol available, in case anyone is working in that area and hankering for a drink! All in all, a great place to have a healthy delightful lunch that won't hurt your wallet. I'll strongly recommend anyone to check out The Snack Culture Company for a bite.